Newest fad on the web is Chatroulette, which instantly matches you up webcam to webcam with strangers anywhere in the world. No registration, no authentication, no delay, no filters. It feels very Web 1.0. It’s thrilling for about 20 minutes. What interests me most about Chatroulette is its introduction of new slang. Facebook introduced the verb to “friend.” Chatroulette has introduced “nexted.” When two strangers meet randomly face to face either one can “next” the other, immediately, or at any time in the conversation. The NEXT button terminates the meeting and brings on the next stranger. If you are not female, or over 30, you’ll most likely be nexted without remorse. In fact on old guy like me will treat any encounter that is not nexted as a victory. The above is an excellent quick movie about the phenomenon, perhaps the most succinct introduction I’ve seen yet. Another very good early article about the service ran in New York magazine as The Human Shuffle (image at top from the article too). Wired.com also ran a decent summary of its appeal. Most of her essay is about why she likes the site even on though she keeps getting nexted — mostly because she is too old. Boyd is the researcher most in tune with teen’s use of the web, and she heralds teenagers’ inclinations to make their own teenage “places” where adults are unwelcomed. 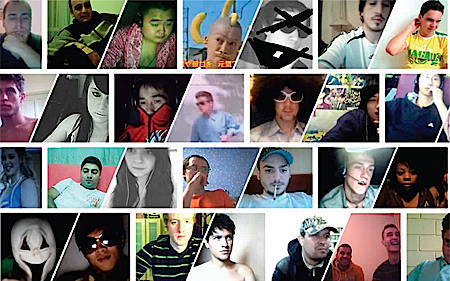 Chatroulette was written by a 17-year old teenager in Russia, and so far seems to favor young kids, particularly young females. The old are simply nexted. Facebook started out for college kids only but quickly outgrew that demographic, and is no longer a haven for kids. your name is patrick. we were the two cute girls who made you spit up your wine. you showed us your space camp souvenirs and we talked about how amazing canadian healthcare is. don’t forget about us! Most connections on Chatroulette are failures. Few end as the one above. Every new media births its own disease. Email birthed spam. Here the spam are perverts. This is an experiment changing by the day, and it remains to be seen whether the angels prevail or whether perversion overwhelms, and the whole site is nexted. But something interesting is stirring. @Erik, Yes, I was just going to add that link. Fantastic. I like to optimistically joke that the inclination of all these mediated-venues-for-connecting-with-strangers-semi-safely like Loopt and Whrrl and other geosocial networking apps and now ChatRoulette will ultimately migrate offline and enable us to just be nice to that random guy sitting next to us at the coffee shop because who knows, he might already be a friend of a friend of a friend or someone we might hypothetically meet on ChatRoulette anyway. I was wondering what happens when celebrities discover Chatroulette. Probably nothing, given the one-to-one, anonymous nature of the thing. Hm, that might be just what we need for the fame, gossip-crazed parts of popular culture. Any way to get this thing on your TV? KK! Web 1.0 indeed! With all due respect you failed to mention the number of pervs and sock puppets that troll CR. It used to be on the Internet nobody knew you were a dog! How long before the stories surface of relationships/marriages initiated on chatroulette?